To 4 July - Really, this entry should go into the June chapter. On the 30 June I spotted this fly on one of the larvae that are on the Iris leaves. At first I thought it may be a parasitic wasp but a closer look at the large images shows that it posesses halteres instead of a second pair of wings. The fly stayed on the larva for over five hours. 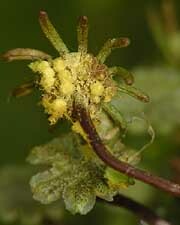 Since then the larva has hardly moved at all, unlike the other individuals that can be seen on other leaves. It is still in the same spot this evening and has become much darker in colour than the others. I have still to identify both the larva and the fly. Although this is a poor image taken through algae covered glass, I've included it because it shows how one of our small (<5mm) water beetles takes a bubble of air with it as it swims under water. Notice how the bubble extends to the length of the body. The rear legs of the beetle seem to emerge from it. 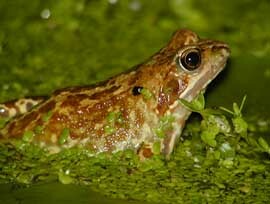 A couple of days ago I saw a toad in the garden for the first time this year. Unfortunately, by the time I got my camera the toad jumped into the pond and disappeared. There are plenty of adult frogs about, but I have yet to see any newly emerged froglets. I shall have to catch some tadpoles to check on their stag of development. Two days ago I spent some time thinning out some of the pondweed at one side of the big pond. I found quite a lot of tiny Ram's-horn type snails confirming their successful breeding in the pond. I was also pleased to find a couple of dozen very small Orb-shell cockles (Sphaerium spp.) among the roots/mud. There were also several adult specimens, although these were up in the vegetation. While on the theme of molluscs, I removed several leaf stalks from the Marsh Marigolds and, as usual I had to take time to return numerous lake limpets (Ancylus lacustris) back to the water. 6 July - I must start this entry with a correction (and an apology for being careless!). 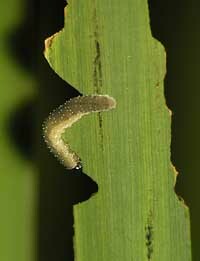 For some inexplicable reason I have been saying that this larva is on a Bur-reed leaf - it is not. 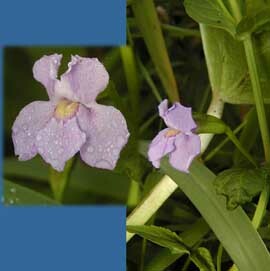 It, and all the other similar lavae are on Flag Iris leaves. I wonder why I didn't correct my own mistake as the leaves of the two plants are easily told apart. I have to thank Steve J. McWilliam of rECOrd for correcting my error. He has identified the larva as a sawfly (Hymenoptera) called Rhadinocerea micans. 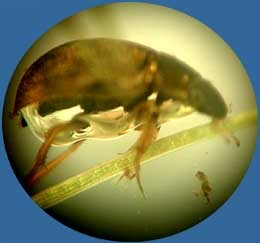 The Flag iris is the only known food plant for this larva. The species does not feature in any of my insect guides so I shall have to look elsewhere for more information about it. 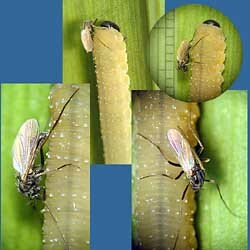 This picture shows the larva that I pictured with the fly on it. Tonight (10pm) it was busy feeding near the top of the leaf. There were six others also in sight, each munching away at the top of its own leaf. By day they move further down the leave and just keep still. If disturbed they will raise their tail end slightly. The first of the teasel plants is now in flower. Unfortunately the plants has 'flopped over' so I need to support it. Why is it not upright like the ones I saw when I was out today? Not having pictured a frog for a while I thought that I would include this shot of one in alert mode by the base of the log in the pond. Up amonst the long leaves of the irises, bur-reeds and reedmace ther is a lot of spider activity now. I need to spend time getting some photographs of the several types that seem to be present. In the meantime here is one of the longer legged types to be seen there, hanging under its web. Its body is about 7-8mm long. I think it belongs to the genus Tetragnatha and hopefully I will get some closer, more detailed photographs to help in its identification. 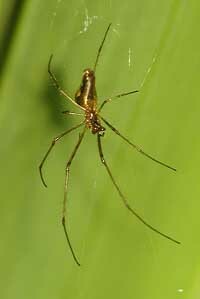 The spider's identity has been confirmed as Tetragnatha extensa, probably the commonest member of the genus - thanks again to Steve McWilliam. 7 July - Sunshine was in short supply today. If it had made more than a brief appearance then this first flower of the Fringed Water Lily may have opened up properly. The flowers only last for a day before they are replaced by the next opening bud. Last year it was the 21 July before the first flower opened. This picture shows one of the female 'umbrellas' (Archegoniophores) of the Liverwort that has toppled over to reveal the sporogonia (the yellow spheres) which split open to shed masses of spores. 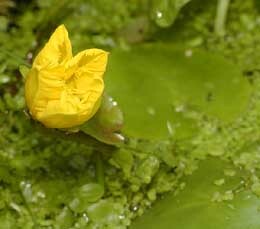 This flower is on a plant that is growing in the pond, hidden by other plants . It has been in flower for about three days. I cannot find the plant in my wild flower guides and I do not remember putting it into the pond, so I need to do some investigating! 16 July - The pond continues to thrive and before we leave for perhaps four weeks in Cornwall I wanted to do a bit of thinning. activities were severely restricted by the number of newt young present amongst the floating weeds. It was almost a case of taking out individual strands and checking each one! When I pulled out a couple of larger plants I spent ages rescuing dozens of tiny orb-shell cockles. They really are flourishing here. Despite the sunshine over the last few days I have only seen one, very delicate damselfly which seemed to disappear again very quickly. The Fringed Water Lilies have not produced more than a couple of flowers since I last mentioned them. Hidden behind some tall grasses are a couple of these plants. 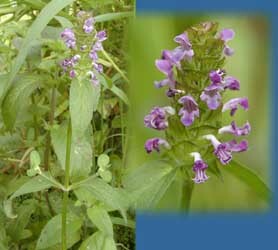 They appear to be Selfheals, although they are not the same as the on the other side of the pond (and pictured in the garden diary). 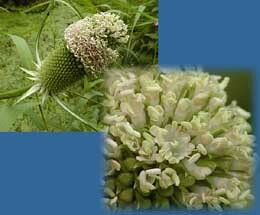 These are much more delicate in appearance, with lighter coloured (and smaller) flowers and leaves. I have not yet come across any young frogs emerging from the pond, the tadpoles I have caught seem to have a long way to go before they emerge, with only hind legs developed so far.